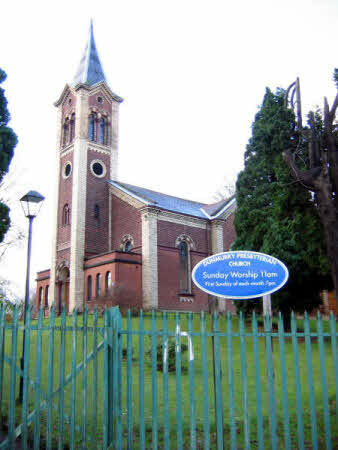 Dunmurry Presbyterian Church, which was sold in September 2008. Ashley Park off Sunnymede Park, Dunmurry. This congregation was first erected between the years 1676 and 1683. In January 1683, Mr. Alexander Glass was the ordained minister. In February 1683, he retired to Scotland in consequence of the disturbed state of the country, and remained there. In June 1694, the Synod of Ulster wrote to him, requesting him to return, but without success. The next minister was Mr. John Malcome, who had been minister of Lower Killead; until he removed here about 1699. He died in this charge 17th May 1729. Mr. Malcome was a man of superior talent, and in the Non-Subscription controversy took a prominent part in support of the Westminster Confession of Faith. He was succeeded by Mr. John Moorehead, who was ordained here by the Presbytery of Templepatrick on the 17th February 1731. He died in this charge on 20th June 1768, leaving a widow and family; and was succeeded by Mr. James Stoupe, formerly minister of Enniskillen, who was installed here by the Presbytery of Bangor on 3rd June 1772. He resigned the charge in May 1780, and was succeeded by Mr. Robert Jackson, who was ordained here on the 11th April 1782. He died on 5th September 1788, leaving a widow and family. In 1790 an entry occurs in the minutes of the Synod of Ulster: - “Ordered that the Moderator write a letter to the Presbytery of Munster remonstrating against the conduct of Mr. Blair (of the Leap), a member of their Presbytery, for irregularly introducing a probationer to Dunmurry, and afterwards presiding in drawing up a call for him - Resolved, that we approve of the conduct of the Presbytery of Bangor respecting Dunmurry in deferring the ordination of Mr. Taggart in that place until the matter might come before this body.” Mr. Taggart and the congregation annexed themselves to the Presbytery of Antrim; and on the 14 May 1805, his connection with this congregation was dissolved by them. The congregation reverted again to the Presbytery of Bangor in 1806 or 1807; and their next minister was Mr. Andrew George Malcolm, who was ordained here on 11th March 1807. He resigned this charge on 11th September 1808, and removed to Newry. The next minister was Mr. Henry Montgomery (afterwards LL.D. ), who was ordained on 14th September 1809. Dr. Montgomery was the great leader of the Arian party; and in 1829 he and many of the members of the congregation seceded from the Synod of Ulster, retaining possession of the church, manse and other properties. A few years after this secession, and because of it, the congregation of Malone, in the neighbourhood of Dunmurry, was erected by the Synod of Ulster; and on the 15th February 1837 Mr. Joseph Mackenzie was ordained as its pastor. (Belfast: Malone q.v.) 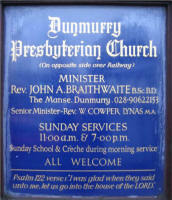 A new congregation of Dunmurry was organised by Rev. Dr. John Edgar for the Synod of Ulster on 23rd March 1860 and on 21stNovember 1860 Mr. Robert James Arnold (lic. Belfast) was ordained as its minister. The new church was a child of the ‘59 Revival, which stirred up the whole community and put fresh life into every Christian enterprise. A temporary church was opened for public worship by Rev. Dr. H. Cooke on 29th April 1860. The present building was opened by Rev. Dr. Morgan on 22nd November 1863. The Rev. Robert James Arnold continued his ministry for 42 years till his resignation in 1902 and death on 22nd December 1918. During these years the church and school were built. The manse was purchased by the aid of a Glebe Loan, and a teacher’s residence by government loan. The cheap railway service made Dunmurry popular as a suburban residence, so that the capacity of the church became overtaxed. In 1903 the church was enlarged. This took place under Mr. Robert Davey (lic. Belfast), afterwards D.D., who had been ordained as minister in succession to Mr. Arnold on 8th July 1902. Dr. Davey also ministered for over forty years. He retired on 31stDecember 1945 and died on 16th December 1946. His two sons, John H. and Ray R., both became ministers of the Presbyterian Church in Ireland and his daughter, Beth (Mrs. Brown) was a missionary in Gujarat. Rev. James Albert Donaldson was called to the congregation from Gt. James St. in Londonderry and installed on 29th August 1946. During his ministry the church was renovated and a new organ, the gift of the Barbour family was installed. Mr. Donaldson retired, due to ill-health, on 1st November 1960, and died on 28th January 1962. Rev. William Cowper Lynas, minister of Ballywillan, Portrush, succeeded Mr. Donaldson, being installed on 13th April 1961. To meet the growing needs of the congregation a large hall was built and was connected to the already existing Trinity Hall. This cost £20,000. In 1971 part of this Hall accommodation was destroyed by bombs and once again building had to begin. In March 1973 a suite of new halls was built at a cost of £58,000. 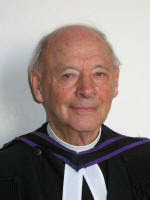 Mr. Lynas retired in April 1989 and is now the Minister Emeritus at Dunmurry. The present minister, the Rev. 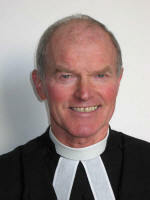 John Braithwaite, previously in Mountjoy and Drumlegagh, Co. Tyrone, was installed in June 1990. 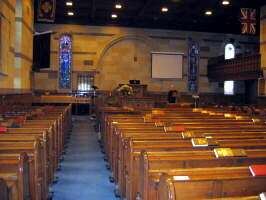 During his ministry the church and the manse were sold in September 2008 although the congregation will have use of the buildings until the end of 2010. 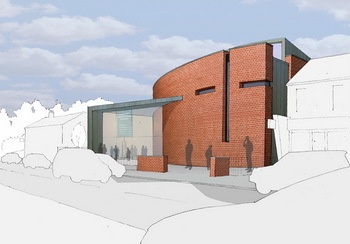 In 2009, work will commence on the developing of a new church complex on the site of the church hall providing an opportunity for a new beginning with facilities designed for the 21st century.